Westport librarians Alex Giannini and Cody Daigle-Orians. WESTPORT — Cody Daigle-Orians and Alex Giannini didn’t mean to get matching tattoos. There was no coordination and, in fact, they didn’t know each other at the time each got his respective ink. But both felt independently compelled to immortalize their love for the science fiction and horror writer Ray Bradbury. Daigle-Orians, 41, has the quote “Write…so as not to be dead, “ from the short story collection “The Illustrated Man,” on his left forearm, while Giannini, 35, has the cover of Bradbury’s collection of short stories “The October Country” on his upper left arm. Each of the librarians found out about the other’s tattoo shortly after Daigle-Orians began at the Westport Library, just shy of a year ago. “It was like, alright, we’re going to get along,” Gianinni said. 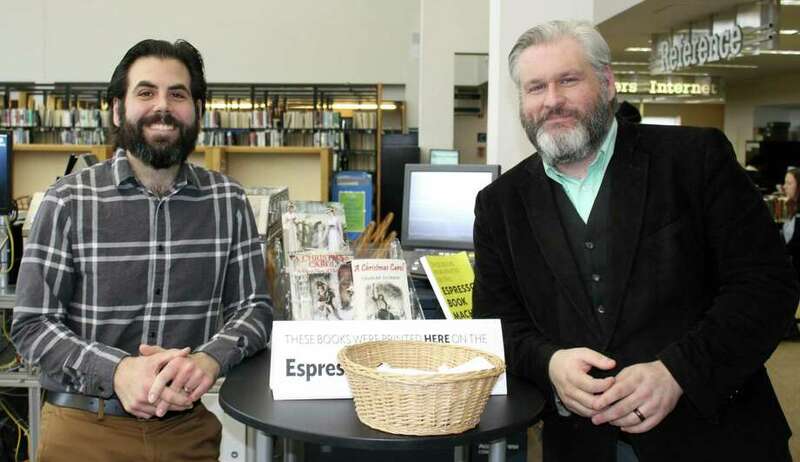 Daigle-Orians, the library’s programming and events specialist, and Giannini, the manager of experiential learning, bonded quickly over their shared love of horror fiction, writing and interest in bringing innovative programming to Westport. “It’s been a wonderful experience meeting Alex and working with him here because our sensibilities are so much the same. We like the same sorts of stories and we also have the same belief about what good programming looks like,” Daigle-Orians said. Both have been writing, or working in adjacent fields, for much of their lives, though they took very different paths to horror, and the library. After graduating college, Giannini, a Stamford native, got into book publishing on the editorial side and then transitioned to a job at the World Wrestling Entertainment in his hometown. The role at WWE was the first for Giannini that required daily writing. He published content for the WWE website and wrote for one of the company’s YouTube shows. Always a fan of the author Neil Gaiman, known for his macabre fiction and graphic novels, Gaiman used the momentum he picked up writing for WWE to pursue his own authorial interests in the Gaiman-vein. “From there, I just started writing on my own in my spare time,” recalled Giannini, who lives in Norwalk. In 2012, he self-published an illustrated children’s book, “Sarah Faire and the House at the End of the World,” a tale of a girl searching for her missing friend on Halloween night. A few years later, Giannini started a Kickstarter campaign and successfully raised more than $15,000 for a second printing in 2015. The book scored Giannini an agent and work freelance writing educational children’s books. Daigle-Orians, on the other hand, was born half a country away in Lousiana, about two hours west of New Orleans. He was drawn almost immediately to writing horror and the works of Bradbury and Stephen King. He remembers writing, at age 6, a set of stories having to do with the corpses in a local cemetery ascending and feasting on the townspeople where he lived. “That was my first set of short stories, that was my beginning,” Daigle-Orians said with a laugh. Also a lover of theater, he went on to work primarily as a playwright after discovering he was, in his words, a mediocre actor and bad director but a very capable writer of dialogue. He spent time at the Playhouse Tulsa in Oklahoma, the Acadiana Repertory Theatre in his home state of Louisiana and Manhattan Theatre Works in New York City. He moved to Hartford, four years ago with his husband, Neil, with whom Daigle-Orians hosted the Bearded Fruit Podcast, which dealt with “politics and culture through an intersectional queer lens,” according to Daigle-Orians. When he first arrived in Connecticut, Daigle-Orians said his writing stalled out momentarily. He credits Giannini, who he calls his “comic book Mr. Miyagi,” who recently provided him entree into the comic book world, for reinvigorating his desire to write and, specifically, getting him back to writing horror. In addition to sharing favorite authors and encouraging one another to produce content, the horror junkies have also worked hard to encourage writing in the community. They partnered up on WestportWrites, which brings authors, agents and publishers to town to speak, and they also lead a writer’s group out of the library. One playwriting seminar they’ve organized this month asks participants to set their scenes in actual Westport locations. This summer, they hope to follow with live performances of the plays in the town spots where they are set. Daigle-Orians and Giannini are also partnering with Staples High School and Westport author Jane Green to plan the Saugatuck Story Festival, which will be a town-wide weekend celebration of storytelling and the arts scheduled for October. The story festival, according to Giannini, may be the only joint event put on by a public library and public school worldwide. It has the potential to be unique and grand in scale, just as the two men prefer. “The bigger, the weirder the idea, I think the more we’re attracted to it,” Giannini said.